Rejuvenating Night Crème - Natural Skin Care Products Showcase. Natural skin care products to invigorate your skin while you sleep. Wildcrafted's Rejuvenating Night Crème is full of the nutrients and hydrating properties your skin needs to be revitalised for another activity filled day. Your Rejuvenating Night Crème works to restore suppleness and a youthful appearance while you sleep! 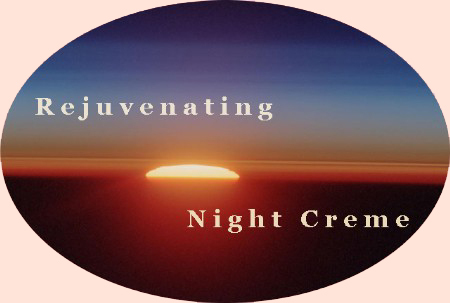 Formulated for all skin types (although it may be too heavy for oily skin types), Wildcrafted Rejuvenating Night crème is packed with nourishing, hydrating and restorative oils and extracts including: Avocado, Apricot, Evening Primrose and Calendula Oils; essential oils of Frankincense, Chamomile and Lavender, Vitamin E and Aloe Vera. For best results Wildcrafted Rejuvenating Night Crème should be used daily after your cleansing and toning regime before retiring at night.